You can either focus to fix your flaws, or improve your positive traits, or if you are lucky, you can do both. However, if you can only do one instead of two, choose to focus on your strength instead of weaknesses. You must always be considerate and courteous towards others. Yet sometimes, the best thing that you can do is just be yourself. Yes, there's a line between being yourself and downright selfish, and as one gains more wisdom, the line becomes clearer and clearer. When a woman becomes a wife and a mother, she should tell herself over and over that being a wife always comes first before being a mother. Why? Because naturally, your subconscious will automatically, instinctively, naturally, put being a mother first over everything else; and if you also put it first in your conscious mind, soon being a wife will be priority number 5321. The more love I pour on my husband, even when he is unloveable, the more loving he becomes. The more effort I pour over caring for my son, the more love grows in my heart for the child. God speaks to imperfect human through imperfection. That's why I accepted the Bible as the word of God, after I read an essay on how imperfect and inconsistent it is. I am not perfect, I guess that's why I can relate to the perfect God through the perfect IMperfection. In similar analogy, I am not perfect, neither is my husband. Therefore, like two different pieces of a puzzle, we are perfect for each other. A woman does not need a man to be complete. I felt complete as a single woman, I feel complete now as a wife and a mother. It's just a different kind of complete-ness, if you know what I mean. There is such thing as quality time instead of quantity time. Last year, a female coworker of mine got a divorce, and her only son has not shown any signs of missing his daddy, even for his birthday. The catch? For years, the father was the one who stayed at home with the son, yet the son feels no closeness with him. Instead, the son feels closer to the mother, who spends hours away working outside the home. I guess it's not enough just to be with someone physically. You need to be really really really be there, body, mind, soul, and show that when you're there, you really care. A forty three year-old friend of the family just died in her sleep. From what we heard, she was sleeping, then woke up suddenly with some difficulty to breath, and there she was gone. We never know when, where and how. Be humble. We may think we are in full control. We are not. God is. I only upload best pictures to the social media and internet. Pictures on me looking my best. Pictures of my home looking its best. Pictures of my family looking its picture-perfect moments. Most likely, others also do the same. So, stop thinking that everybody on blogs and Pinterest have better lives than yours. They only do what you also do: posting the best pictures only for all the world to see. Lovely necklace and the purse is great too! Happy Monday and thanks for linking up...xo! Thanks for stopping by to link up again this week. The pops of red are so great and bring life to the neutral palette! Love the pops of red! My fav color! "The more effort I pour over caring for my son, the more love grows in my heart for the child." Love this! I realised I only have eight more months until my son is off to school, so when he snuck out of bed last night as I was baking I let him help me instead of telling him off and putting him back to bed, as those times with just me and him are very rare and I loved his input and sweetness. Love that you paired such pretty bright red pieces with your neutrals! Great outfit and great words of wisdom. Love how you brighten a black dress with a bright colour. Love your handbag! 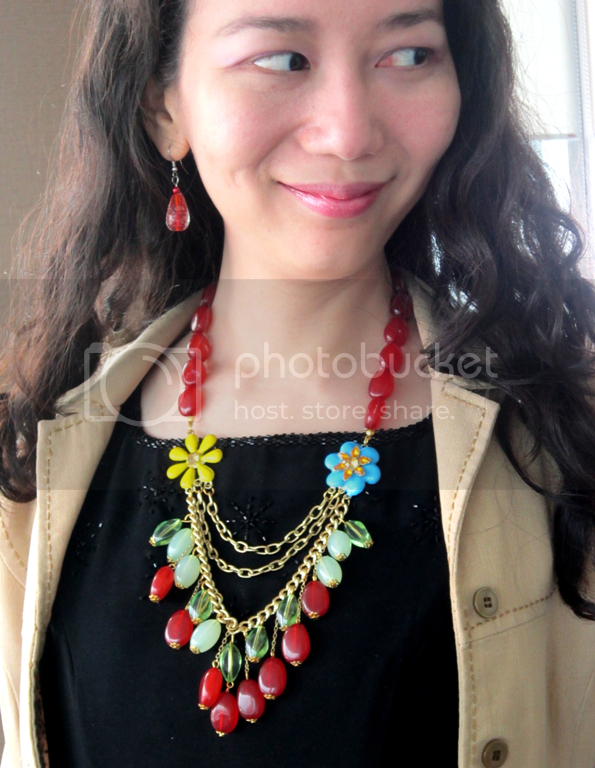 Love the pops of red and the cheery necklace! I like quality time. Quality will most always outweigh quantity.